CIA | Get Off My Lawn!! US lawmakers and officials continue to respond to CIA reports that Russia deliberately interfered with the November election in order to get Donald Trump elected. 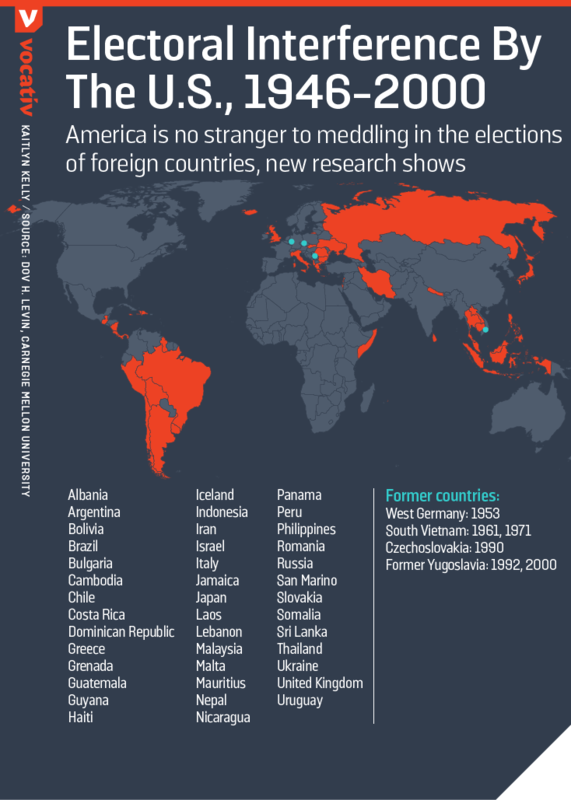 Yet, intervening in foreign election is nothing new, particularly for the US. For decades, American intelligence agencies have used clandestine tactics to put leaders into office who are favorable to US national interests. This practice of meddling dates back to the early days of the CIA and was seen as a necessary strategy to contain the Soviet Union during the Cold War. It’s something Tim Weiner has explored in great detail. He’s won the Pulitzer Prize for his work on clandestine national security programs, and his books include “Enemies: A History of the FBI” and “Legacy of Ashes: The History of the CIA.” He says election meddling is not a gray area for the CIA. After seeing success in Italy, the CIA took this formula — which involved using millions of dollars to run influence campaigns — and brought it to places like Guatemala, Indonesia, South Vietnam, Afghanistan and beyond. According to Weiner, the CIA doesn’t act independently to influence governments and electoral outcomes around the world, but it operates under the direction of US presidents. Though money has the power to influence an election, information — or misinformation — can have a huge impact as well. A number of independent researchers have connected the proliferation of fake news reports seen during the election to Russia and other Eastern European states, something that the Trump team has dismissed. According to Weiner, it’s not just the CIA that believes that Russia worked to influence the US election to help Trump. On Tuesday, Trump officially announced that he has chosen Rex Tillerson, the chairman and CEO of ExxonMobil, as secretary of state. Tillerson has deep ties to Putin, and has made multibillion dollar deals with Russian oil companies in the Arctic. “[Tillerson’s appointment] alone would be enough to mark Trump as the Siberian candidate,” says Weiner. Three years after the CIA began secretly shipping lethal aid to rebels fighting against Syrian President Bashar al-Assad, battlefield losses and fears that a Donald Trump administration will abandon them have left tens of thousands of opposition fighters weighing their alternatives. Among the options, say U.S. officials, regional experts and the rebels themselves, are a closer alliance with better-armed al-Qaeda and other extremist groups, receipt of more sophisticated weaponry from Sunni states in the Persian Gulf region opposed to a U.S. pullback, and adoption of more traditional guerrilla tactics, including sniper and other small-scale attacks on both Syrian and Russian targets. Just over a year ago, the opposition held significant territory inside Syria. Since then, in the absence of effective international pushback, Russian and Syrian airstrikes have relentlessly bombarded their positions and the civilians alongside them. On the ground, Syrian government troops — bolstered by Iran, Lebanon’s Hezbollah, and Shiite militia forces from Iraq — have retaken much of that ground. In brutal attacks over the past three weeks, they have been driven out of much of the eastern Aleppo stronghold that they have occupied since 2012. Trump has made clear that his priority in Syria is the separate fight against the Islamic State, ideally in cooperation with Russia and the Syrian government, as well as other allies. While still vague about his plans, the president-elect has rejected the Obama administration’s view that ending the civil war and bringing Assad to the negotiating table are ultimately key to victory over the Islamic militants, and indicated he will curtail support for the opposition. “My attitude was you’re fighting Syria, Syria is fighting ISIS, and you have to get rid of ISIS,” he told the Wall Street Journal last month, using another name for the Islamic State. Assad, in an interview the week after Trump’s election, called the United States a “natural” counterterrorism ally. He has long labeled the opposition as terrorists equal to the Islamic State. The possibility of cutting loose opposition groups it has vetted, trained and armed would be a jolt to a CIA already unsettled by the low opinion of U.S. intelligence capabilities that Trump had expressed during his presidential campaign. From a slow and disorganized start, the opposition “accomplished many of the goals the U.S. hoped for,” including their development into a credible fighting force that showed signs of pressuring Assad into negotiations, had Russia not begun bombing and Iran stepped up its presence on the ground, said one of several U.S. officials who discussed the situation on the condition of anonymity because they were not authorized to speak publicly. The United States estimates that there are 50,000 or more fighters it calls “moderate opposition,” concentrated in the northwest province of Idlib, in Aleppo and in smaller pockets throughout western and southern Syria, and that they are not likely to give up. Although their fortunes were boosted last year by U.S. and Saudi Arabia-provided TOW antitank missiles, the rebels have long complained that American assistance has been stingy and has come with too many strings attached. Concerned that more sophisticated weapons, including portable antiaircraft missiles, would end up in the hands of extremists, President Obama refused to send them and prevailed upon regional allies to impose similar restrictions on their own arms shipments. “America will have no influence if our comrades are forced [to retreat to] Idlib” from Aleppo, said the commander, who asked not to be identified to speak about sensitive rebel relations with the United States. Most rebels already forced to relinquish territory have gone to Idlib, which is fast becoming a holding pen for what is left of the rebellion. The area is dominated by as many as 10,000 fighters for Jabhat al-Nusra, the al-Qaeda-linked group now known as Jabhat Fatah al-Sham, and an equal number of Ahrar al-Sham, an Islamist group tied to the wider rebel movement that the United States does not consider terrorist. Some experts, including Trump’s designated White House national security adviser, retired Lt. Gen. Michael Flynn, think that the growing operational alliance between the rebels and extremist groups began long ago. At the same time, Flynn has said, the administration downplayed early intelligence indicating that al-Nusra and eventually the Islamic State organization, which combined Islamist extremists and former Iraqi army officers left adrift by the 2003 U.S. invasion, were growing rapidly. Others have noted that cutting off the opposition would not only support Russian and Syrian aims but also would benefit Iran at the perceived expense of Saudi Arabia, Qatar and other regional U.S. allies who view that country as an existential threat. “There will be significant reputational costs with our allies in the region if we abandon support of the moderate opposition,” said Rep. Adam B. Schiff (Calif.), the ranking Democrat on the House Intelligence Committee. Disagreement over whether to take a tougher line against Russia in Syria — including direct military intervention on behalf of civilians and, indirectly, the rebels — in Aleppo and beyond has already caused deep divisions between Obama’s State Department and the reluctant Defense Department and the White House. Secretary of State John F. Kerry has continued negotiations over a cease-fire, meeting again with Russian Foreign Minister Sergei Lavrov in Rome on Friday. Talks have focused on an agreement to safely deliver humanitarian aid and to evacuate both civilians, who want to leave, and the al-Nusra forces that Russia says are the majority of some several thousand anti-Assad fighters in the eastern part of the city. U.S. officials think the militants there number in the hundreds. But Kerry has had little leverage to persuade Moscow to change its strategy, designed to ensure a military victory for Assad. As the incoming Trump administration considers withdrawing from involvement in either assisting or resolving the civil war, others have indicated they will move into the anticipated vacuum. Qatar has said it will continue supporting and supplying the rebels, regardless of what the United States decides. Senators Richard Burr and Dianne Feinstein, the Republican chairman and ranking Democrat on the Senate Intelligence Committee, included an amendment in the annual intelligence-spending bill passed late last month that calls for the Director of National Intelligence to submit an annual report to congressional oversight committees detailing how the CIA and 15 other intelligence agencies interact with the entertainment industry. The measure, which defines the entertainment industry broadly, follows a series of reports published by VICE News over the past year detailing the agency’s role in the production of 22 entertainment-related projects between 2006 and 2011. They included major motion pictures like Zero Dark Thirty and Argo; reality television series such as Top Chef; the cable drama series, Covert Affairs; and books including The Devil’s Light by Richard North Patterson. In the case of Zero Dark Thirty, writer and producer Mark Boal and Katherine Bigelow gave CIA officers involved in the operation that resulted in the killing of Osama bin Laden gifts including dinners, fake pearl earrings, a bottle of tequila, and tickets to a Prada fashion show. The filmmakers, in turn, got access. “Neither the production of entertainment nor the self-promotion of Intelligence Community entities are legitimate purposes for these engagements,” the amendment further states. Other intelligence agencies have also provided support to the entertainment industry, but not to the extent that the CIA has. It’s unclear whether the amendment would effectively put an end to the CIA’s relationship with Hollywood, although that seems unlikely. 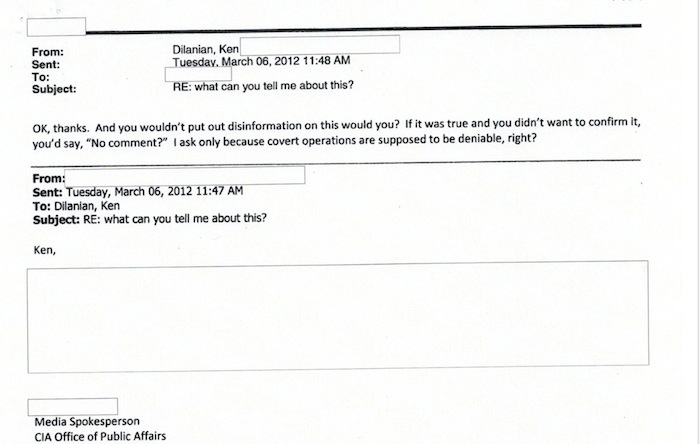 A spokesperson for the CIA was not immediately available to comment about the amendment. Burr’s office also did not respond to specific questions about the measure. Since the release of Zero Dark Thirty and the disclosure that the CIA assisted on the production of the movie, the agency’s Office of Public Affairs, the division that liaises with the entertainment industry, completely overhauled its procedures for interacting with the entertainment industry. The Intelligence Authorization bill still needs to be voted on by the full Senate. A date has not yet been scheduled. How many Americans could identify the National Endowment for Democracy? An organization which often does exactly the opposite of what its name implies. The NED was set up in the early 1980s under President Reagan in the wake of all the negative revelations about the CIA in the second half of the 1970s. The latter was a remarkable period. Spurred by Watergate – the Church committee of the Senate, the Pike committee of the House, and the Rockefeller Commission, created by the president, were all busy investigating the CIA. Seemingly every other day there was a new headline about the discovery of some awful thing, even criminal conduct, the CIA had been mixed up in for years. The Agency was getting an exceedingly bad name, and it was causing the powers-that-be much embarrassment. It was a masterpiece. Of politics, of public relations, and of cynicism. Thus it was that in 1983, the National Endowment for Democracy was set up to “support democratic institutions throughout the world through private, nongovernmental efforts”. Notice the “nongovernmental” – part of the image, part of the myth. In actuality, virtually every penny of its funding comes from the federal government, as is clearly indicated in the financial statement in each issue of its annual report. NED likes to refer to itself as an NGO (Non-governmental organization) because this helps to maintain a certain credibility abroad that an official US government agency might not have. But NGO is the wrong category. NED is a GO. In effect, the CIA has been laundering money through NED. The Endowment has four principal initial recipients of funds: the International Republican Institute; the National Democratic Institute for International Affairs; an affiliate of the AFL-CIO (such as the American Center for International Labor Solidarity); and an affiliate of the Chamber of Commerce (such as the Center for International Private Enterprise). These institutions then disburse funds to other institutions in the US and all over the world, which then often disburse funds to yet other organizations. NED programs generally impart the basic philosophy that working people and other citizens are best served under a system of free enterprise, class cooperation, collective bargaining, minimal government intervention in the economy, and opposition to socialism in any shape or form. A free-market economy is equated with democracy, reform, and growth; and the merits of foreign investment in their economy are emphasized. From 1994 to 1996, NED awarded 15 grants, totaling more than $2,500,000, to the American Institute for Free Labor Development, an organization used by the CIA for decades to subvert progressive labor unions. AIFLD’s work within Third World unions typically involved a considerable educational effort very similar to the basic NED philosophy described above. The description of one of the 1996 NED grants to AIFLD includes as one its objectives: “build union-management cooperation”. Like many things that NED says, this sounds innocuous, if not positive, but these in fact are ideological code words meaning “keep the labor agitation down … don’t rock the status-quo boat”. The relationship between NED and AIFLD very well captures the CIA origins of the Endowment. NED describes one of its 1997-98 programs thusly: “To identify barriers to private sector development at the local and federal levels in the Federal Republic of Yugoslavia and to push for legislative change … [and] to develop strategies for private sector growth.” Critics of Yugoslav President Slobodan Milosevic, a socialist, were supported by NED grants for years. In short, NED’s programs are in sync with the basic needs and objectives of the New World Order’s economic globalization, just as the programs have for years been on the same wavelength as US foreign policy. NED’s Statement of Principles and Objectives, adopted in 1984, asserts that “No Endowment funds may be used to finance the campaigns of candidates for public office.” But the ways to circumvent the spirit of such a prohibition are not difficult to come up with; as with American elections, there’s “hard money” and there’s “soft money”. As described in the “Elections” and “Interventions” chapters, NED successfully manipulated elections in Nicaragua in 1990 and Mongolia in 1996; helped to overthrow democratically elected governments in Bulgaria in 1990 and Albania in 1991 and 1992; and worked to defeat the candidate for prime minister of Slovakia in 2002 who was out of favor in Washington. And from 1999 to 2004, NED heavily funded members of the opposition to President Hugo Chavez in Venezuela to subvert his rule and to support a referendum to unseat him. Additionally, in the 1990s and afterward, NED supported a coalition of groups in Haiti known as the Democratic Convergence, who were united in their opposition to Jean-Bertrand Aristide and his progressive ideology, while he was in and out of the office of the president. The Endowment has made its weight felt in the electoral-political process in numerous other countries. NED would have the world believe that it’s only teaching the ABCs of democracy and elections to people who don’t know them, but in virtually all the countries named above, in whose electoral process NED intervened, there had already been free and fair elections held. The problem, from NED’s point of view, is that the elections had been won by political parties not on NED’s favorites list. The Endowment maintains that it’s engaged in “opposition building” and “encouraging pluralism”. “We support people who otherwise do not have a voice in their political system,” said Louisa Coan, a NED program officer. But NED hasn’t provided aid to foster progressive or leftist opposition in Mexico, El Salvador, Guatemala, Nicaragua, or Eastern Europe – or, for that matter, in the United States – even though these groups are hard pressed for funds and to make themselves heard. Cuban dissident groups and media are heavily supported however. NED’s reports carry on endlessly about “democracy”, but at best it’s a modest measure of mechanical political democracy they have in mind, not economic democracy; nothing that aims to threaten the powers-that-be or the way-things-are, unless of course it’s in a place like Cuba. The Endowment played an important role in the Iran-Contra affair of the 1980s, funding key components of Oliver North’s shadowy “Project Democracy” network, which privatized US foreign policy, waged war, ran arms and drugs, and engaged in other equally charming activities. At one point in 1987, a White House spokesman stated that those at NED “run Project Democracy”. This was an exaggeration; it would have been more correct to say that NED was the public arm of Project Democracy, while North ran the covert end of things. In any event, the statement caused much less of a stir than if – as in an earlier period – it had been revealed that it was the CIA which was behind such an unscrupulous operation. NED also mounted a multi-level campaign to fight the leftist insurgency in the Philippines in the mid-1980s, funding a host of private organizations, including unions and the media. This was a replica of a typical CIA operation of pre-NED days. And between 1990 and 1992, the Endowment donated a quarter-million dollars of taxpayers’ money to the Cuban-American National Foundation, the ultra-fanatic anti-Castro Miami group. The CANF, in turn, financed Luis Posada Carriles, one of the most prolific and pitiless terrorists of modern times, who had been involved in the blowing up of a Cuban airplane in 1976, which killed 73 people. In 1997, he was involved in a series of bomb explosions in Havana hotels, and in 2000 imprisoned in Panama when he was part of a group planning to assassinate Fidel Castro with explosives while the Cuban leader was speaking before a large crowd, although eventually, the group was tried on lesser charges. The NED, like the CIA before it, calls what it does supporting democracy. The governments and movements whom the NED targets call it destabilization. The techniques used by XcodeGhost, the infected version of Apple’s Xcode compiler that has caused an eruption of malware on the Apple China app store, are similar to those developed annd demonstrated by America’s Central Intelligence Agency. A report in The Intercept, a website run by Glenn Greenwald who is well-known for having been the first to report on the NSA spying disclosures made by the former US defence contractor Edward Snowden, claims the CIA detailed the techniques at its annual top-secret Jamboree conference in 2012. Two Intercept reporters, Jeremy Scahill and Josh Begeley, described the CIA’s project to corrupt Xcode in a story published back in March this year. The CIA’s development of their corrupted version of Xcode was part of a multi-year plan to break the security of Apple’s iPhone and iPads, according to this report. It said the Jamboreee conference was an annual affair and had been held for more than a decade, beginning a year before the first iPhone came on the market. The CIA targeted security keys used on the devices and investigated how to decrypt and break Apple’s encryption in its firmware, the report claimed. At the 2012 conference, CIA researchers also said they had created a modified version of Xcode that could plant surveillance backdoors into any software that was created with its use. According to the report, the researchers claimed that the modified version of Xcode would allow spies to steal passwords and intercept messages on devices that were infected. It could also send all data to a central listening post. After the Snowden revelations of blanket NSA surveillance, there has been marked growth in the use of encryption technologies. US tech companies, that have been outed as colluding with the NSA, have been under pressure to provide encryption for their users. This, in turn, has led to the authorities putting pressure on companies to permit government access to encrypted devices through backdoors. The CIA’s efforts to break Apple’s security should be seen in this light, as Apple’s chief executive Tim Cook has taken a strong stand on privacy as a core value, the report said. During the recent Republican presidential candidates’ “debate” in Cleveland, former Florida Governor John Ellis Bush (JEB) wanted to recount his eight years as governor of the Sunshine State. However, it is not Bush the politician who should be of interest to voters but Bush the Central Intelligence Agency “non-official cover” banker in Venezuela and Miami-based real estate businessman/money launderer who should alarm the American electorate. While Jeb’s brother, George W. Bush, glossed over his AWOL status with the Texas Air National Guard, Jeb does not have a military record to defend but he does have a CIA employment record to fess up to. Jeb’s early work in Venezuela and south Florida is much more troubling than Dubya pretending to be on active duty in Texas while he was actually off in Alabama helping a GOP U.S. Senate campaign and getting sloppy drunk in redneck bars. Jeb should fully explain his relationship with Alberto Duque, a Colombian national who laundered drug money for the Medellin and Cali narco-cartels and Nicaraguan contras while serving as owner of City National Bank of Miami and president of the General Coffee Company of Colombia. Apparently, there was more than coffee arriving in sacks of coffee coming into Miami from Colombia. Duque financed a $30 million real estate development project run by Jeb Bush. In 1983, Duque was convicted for fraud and sent to federal prison. Duque hired a Bush family CIA crony to serve as City National Bank’s president. He was Don Beazley, who previously worked for the CIA’s Nugan Hand Bank in Australia. Before it collapsed, Nugan Hand was responsible for laundering money from the CIA’s Golden Triangle opium and heroin smuggling operations from Southeast Asia’s Golden Triangle and paying off U.S. surrogates in Asia, including Ferdinand Marcos in the Philippines, Suharto in Indonesia, Park Chung Hee in South Korea, and various Thai generals. In return for CIA money gifts, Marcos ordered his Energy Minister, Geronimo Velasco, to have the Philippines National Oil Corporation enter into business relationships with three Bush family-owned businesses: Zapata Petroleum Corporation, Zapata Offshore Company, and Overbey Oil Development Corporation. The three Bush firms were also linked to various CIA activities, including the abortive 1961 Bay of Pigs invasion of Cuba. Jeb Bush’s Texas Commerce Bank was also the bank used by the Zapata companies. Velasco died of a sudden heart attack in San Francisco in 2007. Velasco’s Republic Glass Corporation became a holding company that owned a number of British Virgin Islands-based subsidiaries. On January 25, 1980, Frank Nugan, the Australian co-founder of Nugan Hand Bank, was found dead in his car near Bowenfels, New South Wales from a “self-inflicted” rifle shot wound to his head. The card of ex-CIA director William Colby, who, himself was found floating in Chesapeake Bay, Maryland in 1996, was found in Nugan’s pocket. Colby was Nugan Hand’s legal counsel. Hand had planned to move with his wife and three young children to Florida but someone apparently did not like the idea of Nugan showing up in Florida during the year George H W Bush was trying to become the president of the United States. Jeb Bush’s relationship with City National Bank, whose other senior director was Leonard Abess, a director of the Anti-Defamation League (ADL) Foundation, ensured that a large share of NED money flowed to Israeli security firms like Tadiran, which helped Guatemala and Honduras track down leftist guerrillas and exterminate them. Jeb Bush’s current support for Israel stems from his early business relationships with Zionists like Abess and other offshoots of the Meyer Lansky “Kosher Nostra” crime family in south Florida. Abess is currently a member of the Federal Reserve Bank branch of Miami. It could be argued that Jeb Bush, from his in-brief by Gambino at the CIA in 1977, to his unsuccessful run for governor of Florida in 1994 was a reliable CIA and Israeli asset. In 1990, Jeb urged his father to pardon Cuban terrorist Orlando Bosch, a man wanted for the 1976 bombing of a Cuban civilian passenger plane that had taken off from Bridgetown, Barbados. Jeb Bush was also a supporter of the U.S. House of Representatives candidacy of Ileana Ros-Lehtinen, one of the most rabid anti-Castro and pro-Israeli members of Congress. Jeb also succeeded in having his father name Dexter Lehtinen, Ileana’s husband, to be U.S. Attorney for Southern Florida. Lehtinen permitted a number of Jeb’s friends in the Cuban and Jewish communities in southern Florida to escape prosecution for crimes ranging from drug money laundering to narcotics smuggling and contract assassinations to banking fraud. Most of Jeb’s business friends were CIA-linked bankers. In addition to Beazley, Duque, and Abess, these included Paul Helliwell, a Miami-based lawyer and the owner of two CIA money laundering banks, Great American Bank of Miami, later bought by Nugan Hand and indicted in 1982 for drug money laundering, and Castle Bank & Trust Ltd. of Nassau in the Bahamas. Helliwell, a veteran of the Office of Strategic Security (OSS) during World War II, died at the age of 62 on Christmas Eve of 1976, just a few weeks before George H W Bush departed as CIA director. The autopsy said Helliwell died from “complications of emphysema.” Castle Bank shut down in 1977, the same year that Jeb moved to Caracas to work for Texas Commerce Bank. An affiliated bank that shared directors with Castle Bank, Mercantile Bank & Trust of Freeport, Bahamas, also suspended operations in 1977. Castle Bank, which had laundered CIA money to pay off such dictators as Marcos in the Philippines, Rafael Trujillo in the Dominican Republic, and Anastasio Somoza in Nicaragua, saw much of its revenue initially come from Nationalist Chinese drug smugglers operating out of the Golden Triangle in Southeast Asia. One of Gambino’s last acts as the CIA’s director of security was to preserve the myriad of CIA special clearance categories, including those that permitted NOCs like Jeb Bush and drug- and arms-smuggling proprietary companies and money laundering banks to flourish. The Carter administration had ordered the intelligence community to reduce its compartmented access system with over 50 code words to just five special code word compartments by July 1980. The National Security Agency and Gambino balked and the new system, code named APEX, never materialized. 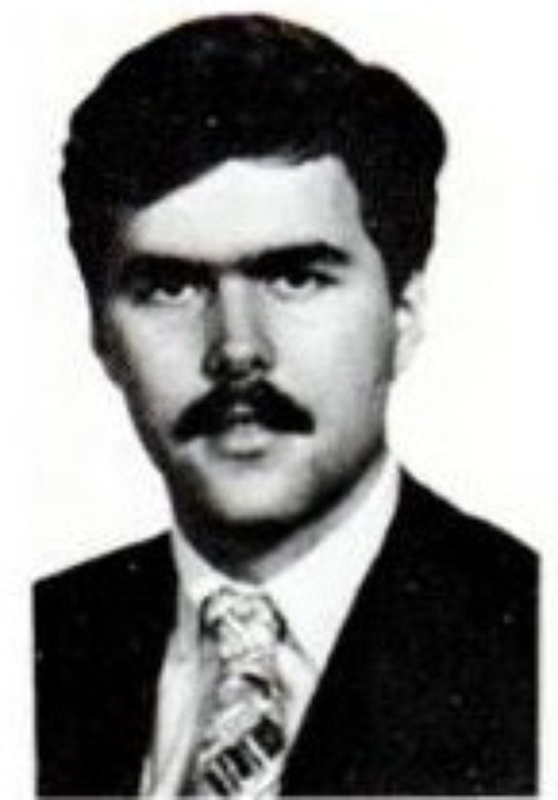 When Jeb’s father became vice president in 1981, APEX was scrapped for the original system, which saw the number of special compartments grow in number in order to accommodate operations that included trading weapons for hostages with Iran and covertly funding the Nicaraguan contras. One CIA official who was alarmed over APEX was the man who CIA director George H W Bush named as deputy director for covert operations in 1976, Ted Shackley, aka the “Blond Ghost.” Shackley was an old colleague of George H W Bush stemming from his days as the station chief of JMWAVE, the Miami CIA office dedicated to overthrow Fidel Castro in Cuba. It was there that Shackley and Bush became involved with Cuban exile and mafia parties that were later tied to the assassination of President John F. Kennedy in Dallas in 1963. The “Cuba thing” was mentioned by President Richard Nixon on Oval Office tapes subpoenaed in the Watergate scandal. It is now known that the “Cuba thing” was code for the assassination of Kennedy and the CIA’s involvement in the operation. Shackley was also involved with Donald Gregg in the Phoenix assassination program in South Vietnam and Project FUBELT, the CIA operation to overthrow President Salvador Allende of Chile on September 11, 1973. An undated TOP SECRET memo to Shackley from a CIA official whose name is redacted but believed to be Gambino provides details of Shackley and the CIA’s security division opposition to APEX. The memo states: “there is no intention of establishing under the Community Security Group responsibility for a centralized computerized data base of all SCI [Sensitive Compartmented Information] approvals. The CSG has no functional role in this area at this time, and one is planned for the future. The CIA Special Security Center’s Compartmented Information Branch is the home of the community service on special access certifications and records. They handle SPECLE . . . Any effort to upgrade the SPECLE system is years away. Further, NSA has taken no steps toward inputting their COMINT clearances.” In other words, the policy of President Jimmy Carter and his CIA director, Admiral Stansfield Turner, to limit CIA special compartments and display more accountability was being undermined by two Bush embeds in Langley, Gambino and Shackley. Shackley and Gambino were eventually forced by Turner to retire. The almost limitless penchant of the CIA to create special compartments permitted assets like Jeb Bush at the Texas Commerce Bank and Barack Obama, Jr. at Business International Corporation to evade public scrutiny as CIA employees. In a January 24, 1980 memo, to Gambino from the CIA member of the APEX Steering Group, special compartments are described as as protecting “industrial” personnel working for the CIA, NSA, and Defense Intelligence Agency. Jeb Bush’s rise to financial and political power in Florida is coupled with a trail of dead bodies, failed banks and savings and loan institutions accused of laundering money for the CIA, and dubious characters who served as CIA assets. Until Jeb Bush fully accounts for his business activities in the 1970s, 80s, and early 90s, he is actually more unfit for the presidency than his draft-dodging and AWOL status brother, George W. Bush.